We were going camping – hooray! 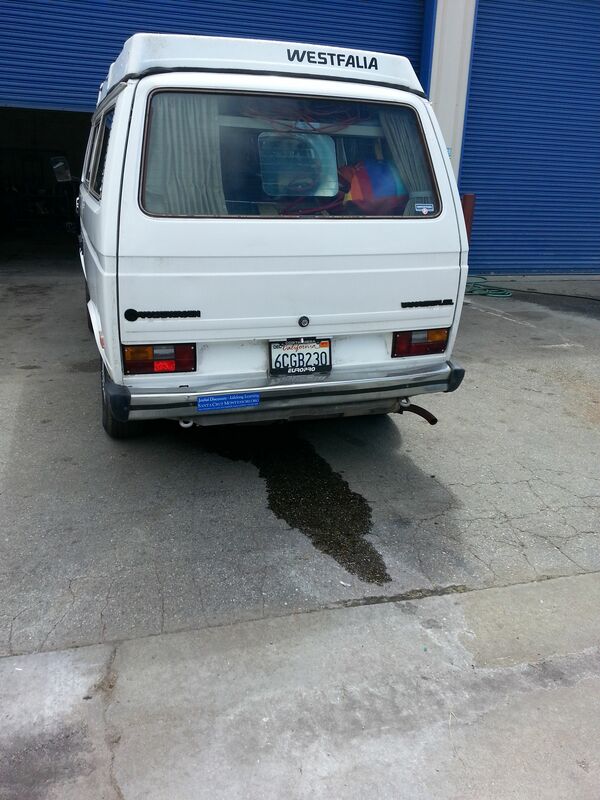 So we loaded up our 1985 VW Westfalia camper van – hooray! – and headed out of town. But first Jason wanted a cup of coffee at the local Starbucks, so we got only to the next town, three miles from home. He put the coffee in the camper’s cup holder – which is all of about an inch deep – and started driving. We didn’t even get out of the parking lot before it spilled spectacularly. And, indeed, the hatchback was wide open. The light was red, the cop was ahead, and we couldn’t pull over. So we did what we could, which was switch to the right lane, stop at the light, and I jumped out and slammed the hatch closed. Next to the cop. Whew! Nothing had fallen out! But now we were in the right-turn-only lane and so we were forced to go in the wrong direction, away from the highway. Okay, said Jason, we’ll gas up at this station up ahead. Plus, I can get a replacement coffee there, too. And THEN we’ll head out on our trip. So, we gassed up, got a coffee and got into the camper. And then he turned the key in the ignition and nothing happened. Now, I could end the story right there, because, honestly, what’s gonna top that. But I’ll tell you the rest of what happened. We tried and tried, but the camper wouldn’t even attempt to turn over. And the clutch pedal wouldn’t go down properly and there was a mysterious leak under the driver’s side. So, Jason called triple A and I looked around and offered to walk over to what looked like a car shop. It was the next business over, separated from the gas station by an empty lot. I walked over. The sign said they fix VWs. And it was closed. Of course. Out came a guy and said, “How ya doin’?” Turns out he wasn’t supposed to be there but he hadn’t finished a brake job from the day before, and, sure, he’d come take a look. He walked over and managed to do some sort of rolling jump start thing and drove our camper to his shop! Finished the other car and got ours on the lift! Said he’d start fixing it right then – did we want a ride home from his girlfriend? Jaw on ground. 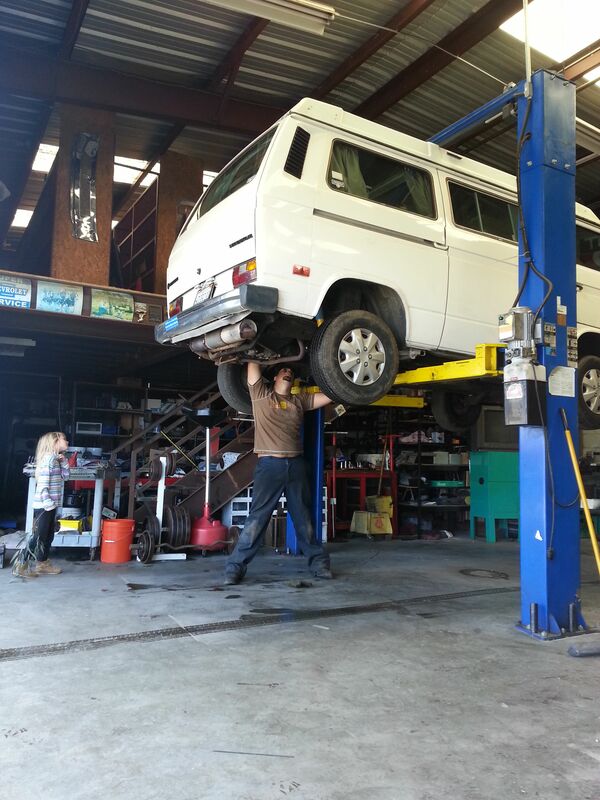 We had found the world’s nicest mechanic. Long story short, he tried for hours but couldn’t fix everything that day, so we took the pickup truck and went tent camping instead. Had a wonderful time. Our fantastic mechanic fixed the camper while we were gone and now it’s right as rain. And thinking it over we are really very, very lucky. If Jason hadn’t spilled his coffee, we would have broken down on the highway. Maybe causing a crash. Possibly in the middle of nowhere. And certainly not next to the world’s nicest mechanic who was putting in extra hours when the shop was closed.